Today we introduce you to the Amsterdam Beer Bike. Yes, it's a unique, creative way to explore the wonderful city of Amsterdam. It’s a bicycle with a bar set up on it. A bicycle with A BAR set on it! 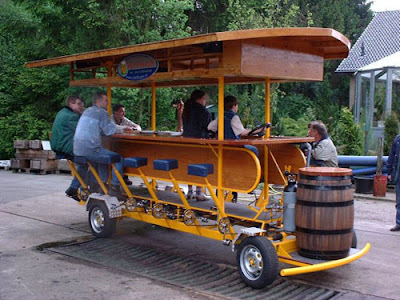 The beer bike is suitable for 10 to 22 Knights, who power the bike while they are sitting at the bar. Amsterdam City Centre allows beer bikes if they do not cause any inconvenience and if there is a qualified driver / bob on the beer bike. 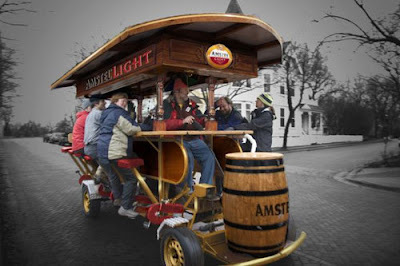 So fellow Knights, while we plan yet another roadtrip, we'll definitely have to put the Beer Bike on the ol' Moleskine "Must Do While In Amsterdam" list. Snow is coming to Southern Indiana. Beer Bike is awesome! I don't recall them when I was there in the late 70's? I'll take a ride with the 2 Blondes! Getting your exercise while drinking...it doesn't get much better than that! next time I'm on the bike at Bob's I'll think about getting in shape to make the hills and lift a stein...hey, whatever it takes to motivate us to exercise! Thanks for the link. Glad we could introduce you to the Beer Bike.